Today I am going to talk about the wholesale feature of a Magento E-commerce website. The wholesale feature on Magento is not a simple setting you can just switch on or off in the admin backend. For a truly effective wholesale program, some of the features require additional programming and extensions to seamlessly integrate into your website but these features are guaranteed to grow your wholesale business. Administrator approval for new registration, page content and promotion, and a variety of products and pricing for customers just to name a few. Read on to find out how to incorporate Magento’s wholesale feature for your business. The default for signing up new customers on Magento is to automatically approve the customer to a general group. This allows them access to all the options as a regular customer, e.g. wish-list, order history, etc.. However, as a wholesale business owner, you will have a point in your business where you would want to limit who can register as a wholesaler on your website. The wholesale feature enables you to verify a customer’s identity before they can see wholesale pricing and start making purchases as wholesalers. The default Magento registrar page can be customized to have additional fields to not only gather standard business information, but allow the customer to upload an image of their business documents directly on the sign-up form. After you or your accounts staff review and verify the information, new accounts can be manually approved before they are able to login and navigate the website. 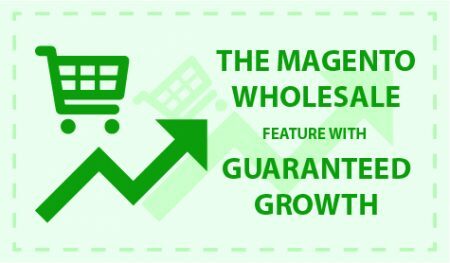 Once you have successfully approved your customers as wholesalers, an even more powerful magento wholesale feature can now be implemented. You now can display different content on your website to logged-in wholesale customers. If you have specific groups you wish to appeal to, it is a good idea to use different promotional coupons or shipping codes for each group. There is also the option to change the shopping cart pricing rules so that you can regulate the prices you are offering to wholesalers. For more advanced needs, a separate Magento store can be setup on your website if you want certain categories and products in your catalog to be specifically viewed by particular customer groups. For example, your wholesaler can see your entire product line and regular retail customers can only see one category. You can even set up additional options and minimum purchase quantities for wholesalers. Group pricing (wholesalers can get 10% off) and tier pricing (buy “10 and above” for 10% off, buy “20 and above” for 20% off, etc…) each individual product can also be set for wholesaler discounts. The Magento wholesale feature is a very useful feature you would want to utilize for improving the functionality of your E-commerce website. Not only does it help your business grow, it will provide a better user experience. Many people still use a fax machine or email to process wholesale orders, it is time to use the scalability of technology to help your business service more wholesale accounts. If you are having trouble setting up the wholesale feature on your Magento website, contact us at Ready Artwork for help today!